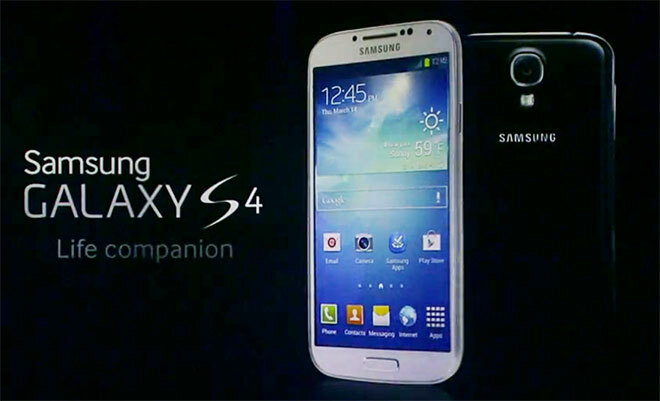 It’s official and it’s now here, the Samsung Galaxy S4 has been revealed in New York. This feature turns the phone into a remote control for your TV, cable or satellite set-top box. How? Smasung’s new device has an infrared transmitter that can transmit instructions to your home electronics. WatchON has the potential to help this phone become the ultimate universal remote. If it’s all about numbers, the S4’s 13-megapixel rear-facing camera improves on what was found in its predecessor, the S3 (which has an 8-megapixel image sensor). The extra resolution should help this latest Galaxy phone snap sharper photos, and Samsung has added more than 20 nifty controls for creative shots. One will let you take out unwanted background distractions, such as annoying photobombers at the bar. Another effect that stands out will let users snap multiple photos in sequence, and then blend the frames together to produce a continuous time-lapse photo. Taking a photo using both front and rear cameras at the same time seems like a gimmicky feature. Usually the action is in front of the camera, but the thinking here is that a dual-shot photo can combine the subject in front (your kids) and your expression behind the lens. However, the S4’s Dual Camera will also come in handy during video chats. Want to show your significant other the amazing view from the top of Whistler while still maintaining eye contact? Samsung’s Dual Camera should do the trick. Many people complain about their phone’s poor battery life. Others wish the screen were bigger. Solving neither complaint, Samsung decided we needed a feature that would scroll through content on the screen, without us lifting finger. Paying close attention to your face like a police officer performing a RIDE check, the phone will be able to tell when to scroll the web browser up or down. The phone also takes wrist movements into account as well. First announced last month, this security feature isn’t exclusive to the S4 – but Samsung made sure to highlight it when unveiling the new phone. KNOX (perhaps in all caps to emphasize strong security) is meant to let employees use their Android-powered Samsung phones securely on corporate networks. The feature seems to take aim at BlackBerry’s dominance in the corporate sector, an area where Samsung is eager to make gains. People in the North who wear gloves will love this new feature. Hand gestures can be used to answer a call or change the song you’re listening to, among other functions. The S4’s infrared and proximity sensors will also be able to tell when your finger hovers over something like an email or a video, showing you a preview of what’s inside the content. Need to call a favourite contact? The GS4 can speed-dial contacts you hover a finger over. The best part, you can now use your gloves with your phone. Sprechen sie Deutsche? Donde esta el aeropuerto? This phone should be able to help you communicate in other languages with S Translator. Whether it’s text or voice that needs to be translated, Samsung says the phone’s S Translator will make travel a joy. But will restrictive roaming fees hurt your chances at translating in a foreign train station? During the unveiling, Samsung said several common travel phrases will be stored locally on the phone itself. While the S4 will be plenty speedy with at least a quad-core processor on many models, somebody at Samsung must’ve decided that the company needed a phone that could run at Autobahn speeds. So in addition to building the Galaxy S4 with a base 1.9 Ghz quad-core processor, some models will ship with a 1.6-Ghz Octa-core processor inside. Yes, you read that right. Eight “brains” of processing prowess. The faster model will be the Mustang of smartphones. If size matters, Samsung likely decided to go big or go home with this Galaxy handset’s five-inch display. It’s not just any screen, but a Super AMOLED screen rated at 441 ppi (pixels per inch). Prepare to spot more wrinkles than usual in photos stored on your phone. By comparison, Apple’s Retina Display on the iPhone 5 has a density of 326 ppi. Are you getting enough exercise to burn off that late-night poutine? The latest Galaxy phone can apparently track your health with some basic input action from the user – and a sensor not usually found in smartphones. Samsung fitted a barometer to the phone so that it can determine your comfort based on temperature and humidity levels. Some were expecting the Octa-Core Samsung Exynos 5 processor in the phone and that’s an option, with a 1.6GHz model. However, a 1.9GHz Quad-Core version of the phone will also be sold, depending on where you live in the world. The battery is removable, so you can carry a charged spare if you’re going to be out for a long time. It also means that a failing battery can easily be replaced.